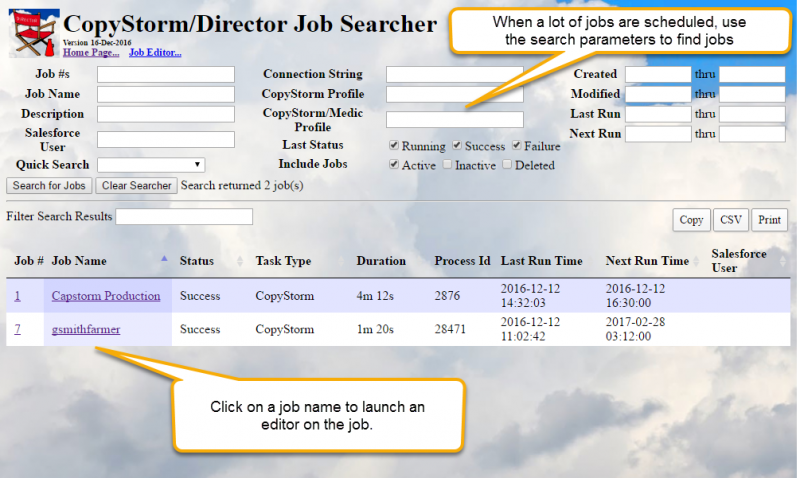 The CopyStorm/Director Job Searcher searches for jobs defined in the CopyStorm/Director database. If your organization is not managing 100s of CopyStorm backups, the only control you may need is the “Search for Jobs” button. The top portion of the page contains parameters limiting the jobs returned when the “Search for Jobs” button is clicked. You can find descriptions for these parameters on the Job Editor page. The bottom part of the page contains jobs found in the most recent search. In addition, the hyperlinks in the job list will open an editor for the selected job. This editor is web-based and contains a subset of the functionality of the Java-based editor.